Professional Advice On Custom Home Construction, Home Improvement, and The Design Build Process. Are Doorless Walk-In Showers Good For a Bathroom Remodel? One of the significant trends of the past several years among homeowners is remodeling the bathroom to create a spa-like en-suite. When it comes to shower design, the most recent trend has been for a doorless or walk-in shower. While this design element has been around for centuries, recently it's experiencing a renaissance thanks to its incredible functionality, as well as it's beautiful look. As more boomers are choosing aging-in-place as a lifestyle choice, a walk-in shower with no or a low-threshold is an excellent option for older homeowners. If you're considering a bathroom remodeling and one of your must-have options is a walk-in shower, read on and learn the advantages, disadvantages, tips and style ideas for this luxurious design choice. This doorless walk-in shower was designed with accessibility and aging-in-place in mind. It has no curb, it is outfitted with grab bars, it has multiple shower heads including a handheld shower, and the bench seat is integrated into the design. What Is A Walk-In Shower? A doorless shower is known by many names including a walk-in shower, a roman shower or a roll-in shower (to name just a few) is a shower that has been architecturally designed not to require a door or curtain. Typically it's designed to isolate the shower head around a corner, or behind a wall, and grade the shower pan to drain water away from the opening. Because it does not have a threshold, flooring can run unobstructed throughout the bathroom giving it a clean, modern look. A walk-in shower is a universal design element that can make it safe for homeowners to remain in their homes as they age. From a design standpoint, a walk-in shower keeps the bathroom as open as spacious as possible. Because there is no threshold or shower door, it allows your tile work to shine. Without a door to clean, maintenance is quick and easy. 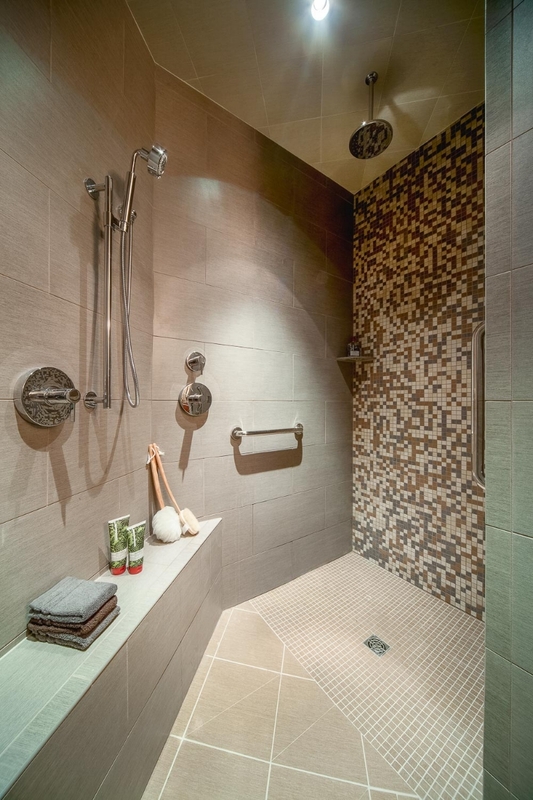 A doorless, walk-in shower offers many advantages over a traditional shower stall. However, before you decide, here are some facts to consider. They can be installed in a corner, or replace an existing bathtub or shower. However because they are open to the rest of the bathroom, the walls and flooring must be designed to contain the water. The design often involves custom drainage and tile work, depending on your needs and preferences. Tiled or waterproof walls can be floor to ceiling, or at a minimum, higher than the shower head. The to meet the minimum standard for universal design principals is 36x36 inches. The optimal size is at least 42x60 inches. This oversized, ADA-accessible shower can work as a a doorless shower or the door can glide closed. The door need not be closed in most circumstances, but if the accessible shower bench is used or if a chair is wheeled in, then the glass door can slide closed for more flexible positioning in the shower without overspray going out. A custom base made from a material like onyx or custom tiled is your best choice. To eliminate the threshold a sloped floor is necessary in the shower which both of these choices allow. Water needs to be directed away from fixtures and lighting in the room. The spray radius should be considered when choosing your fixture. Using an overhead “rain” type shower head can help to contain water flow. Adjustable handheld shower heads are also a good choice, but consider that a handheld tends to spray water all around. Walk-in showers do not require special venting, but lighting is always a desirable feature. If your space is large enough, ventilation and lighting can be installed within the area, however, with proper ventilation within the bathroom, it is not required. Because there are typically walls around a doorless walk-in shower, dedicated lighting is almost always necessary. When planning your shower, consider the height and location of any wall niches for soaps and shampoo, shower seats and grab bars. Each can be custom configured for the height of the primary users and any special needs for aging homeowners. This doorless shower is fully ADA accessible and was retrofit into the space of a standard bathtub. A linear drain was installed on the floor, and the whole bathroom floor is waterproofed to prevent damage from any incidental overspray that makes it past the shower drain. Aging-in-place is a growing trend among older homeowners. A walk-in shower without a glass barrier, or a threshold, makes the bathroom more accessible for people of all ages, and with all levels of mobility. Consider making the entrance wide enough for wheelchair or walker access. Easy accessibility is also a great selling point down the road. This is a big selling point for homeowners! With no glass, there's no longer a need to keep a spray bottle or squeegee handy. Simply wipe down the walls periodically. Leaving off the glass door can significantly reduce the cost of installation, as long as you don't increase the size of the shower and the amount of tilework in the design process. Even with correctly oriented shower heads, a sloped floor, and perfectly designed drainage, there's still going to be a little splashing. A proper doorless shower requires a larger bathroom space to ensure that water doesn't end up where you don't want it to be. Even with a clear glass door or shield can provide some privacy because the water drops obstruct the view. Choosing a frosted or designer option can take it a step further. Since the point of a doorless shower is to keep things open, you will be too, every time you take a shower. One of the benefits of a shower enclosure is that they block airflow and trap warmth in the shower. Open showers don't offer these benefits. Pairing an open shower with radiant floor heating can keep your bathroom comfortable, but if you're susceptible to chills, you may want to reconsider your choice. A walk-in shower offers homeowners many benefits like easy accessibility and lower maintenance making it a perfect choice if you're planning on aging-in-place. While there are some drawbacks, they're minor when weighed against the benefits. With the exception of not having a large enough space, using frosted glass, and installing a radiant floor heating system can go a long way towards making an open shower the perfect choice. If you're considering a bathroom remodeling project, would like to learn more about the benefits and beauty of adding a walk-in shower and live in the Madison, Wisconsin area, give the experts at Degnan Design Build Remodel a call at (608) 846-5963. We can help you to design the perfect spa-like bathroom to meet your needs now and in the future! Want to learn more? Read about Choosing a Shower Head Style For A Master Bathroom Remodel. This article was updated by Abe Degnan on 7/30/2018. We provide home improvement services including kitchen and bath remodeling, basement refinishing, additions and custom homes. Would you prefer to book an appointment over the phone? 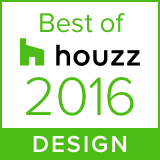 Get Remodeling Advice Delivered To Your Inbox - Sign Up Below! Thank you! Expect an email from us soon. Learn the history of wallboard, get the lowdown on the different colors and discover the types drywall used for home remodeling and construction. Read our professional advice on hiring a home remodeling contractor in Greater Madison. Learn what to ask and how to choose your remodeler. Including a television in a bathroom remodel is a trend that's becoming more popular. Here's what you need to know about placing a TV in the bathroom. View the case study of this multi-room home remodel with a new kitchen, master bath, and finished basement and learn what goes into a large home remodeling project. The Bungalow style home has surpassed the Ranch in popularity. Remodeling an older Bungalow is a way of keeping the look and adding contemporary amenities.